Date completed: 18th March 2017. Exactly six years ago (18/3/11) I was in this vicinity for walk 33 up on the Catbells – High Spy ridge. Weather conditions: Poor, the wettest walk for some time. It never rained particularly heavily but there was a steady drizzle more-or-less throughout, except for the half hour or so I spent climbing Castle Crag; but it started raining again on the summit. 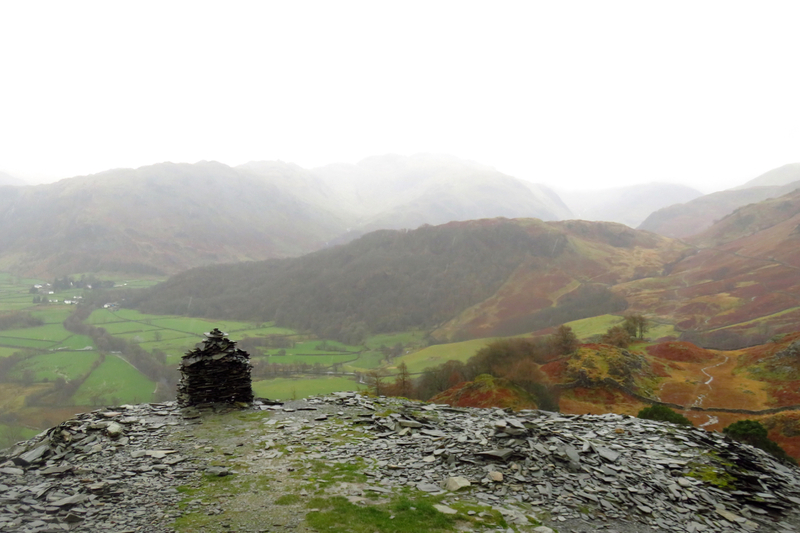 Borrowdale — in the rain. 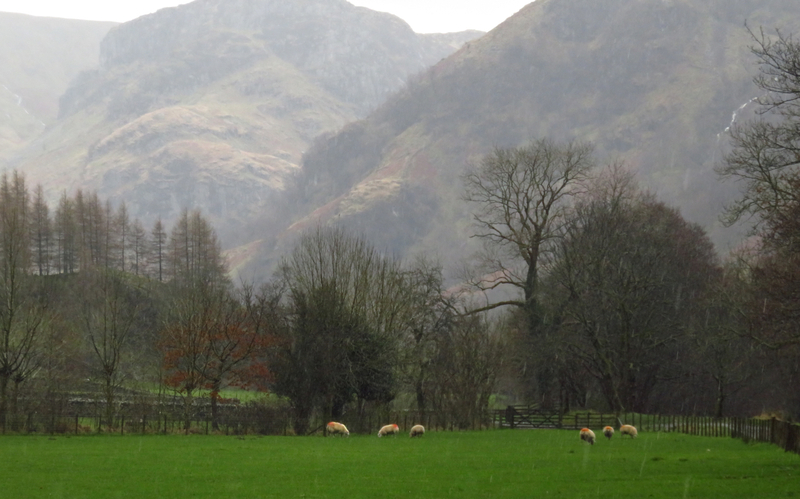 That is Eagle Crag in the background to the left. Summits bagged: Castle Crag (951 feet above sea level, number 91 of my second round). I previously bagged this, with Clare and Joe, on walk 4, 24/7/09. Of all my second round summits then, this makes it the first to be bagged as the sole fell on a walk, twice. Start and end points: Started at Keswick bus station. Finished in Rosthwaite, from where I caught a #78 bus back to Keswick. I left the bus station just after 10am and was comfortably in time (having more than an hour to spare) to catch the 14:55 service at Rosthwaite. Distance walked: 8 miles approximately. Total ascent: 900 feet approximately. Pub at end: The Riverside Bar in the Scafell hotel, Rosthwaite, the same place I ended the walk on this day in 2011. A decent choice of beer. 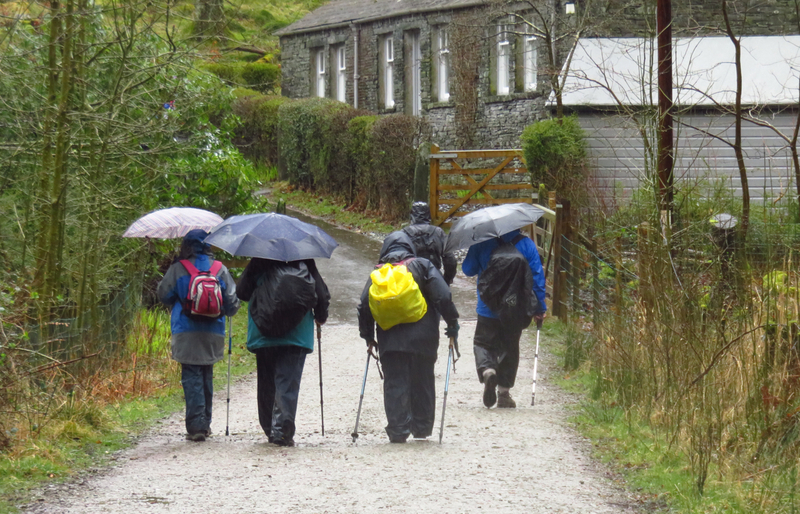 Busy and noisy with walking parties, despite the poor weather. Check out the information board on the annual Borrowdale Fell Race and marvel at the athletic ability of the runners, as indicated by the winning times (this is a 17-mile race over ferociously hard terrain). Route: As noted in the commentary below, the weather today was such as to dissuade me from venturing onto the high fells. So this was, deliberately, a low-level and non-arduous walk, the sort one could take one’s grandmother on — mostly. 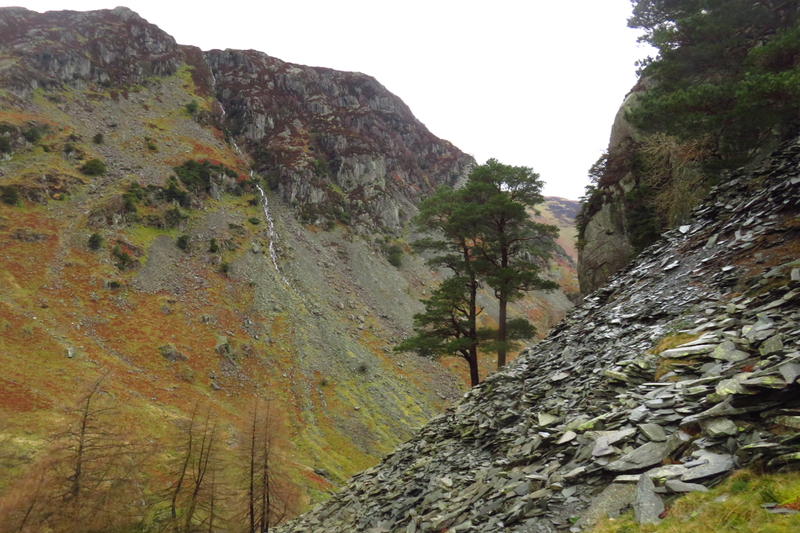 The exception is Castle Crag which, while a short and quite safe climb, is not without its occasional difficulties, both in ascent and descent. This relatively welcoming nature, and proximity to Keswick and the Derwentwater boat launches, means that it is almost inevitably going to be a very busy walk. I wouldn’t do it, at least, not on a weekend, if you really don’t want to be around people — and their dogs, this was probably the doggiest walk I’ve done. The route from Keswick bus station to Portinscale, and then south, through Fawe Park, is a familiar one to me now (walk 27, walk 33, walk 107), and well-enough signposted to lead first-time visitors — as long as they’re also equipped with a map — towards the foot of Catbells. As the path hits tarmac again, bear left, following the sign to Hawes End, and dropping down off the road, taking a path that leads to the shore and a first proper sighting of Derwentwater, and very beautiful it is too. More or less, you then follow the shore all the way through Brandelhow Park down to the head of the lake (the southern end). This should be easy enough, the paths are clear and there will probably be dozens of other people following the same route one way or the other. The only point where you might go slightly wrong is towards the end where a sign indicates a left turn to Lodore, but a better track seems to go on ahead. Take the left path however: then, after another few hundred yards and just as it is about to cross a boardwalk, take a path on the right. This leads to Grange. Bear in mind that you do not now cross the river Derwent until the very end. You come into Grange along the road (take care here in the summer, it will be busy) and note that if you were planning to have lunch here, there is no pub in the village itself, only a small and crowded cafe. The Borrowdale Gates hotel will do lunch and drinks but is out on the northern side, so don’t walk past it only to find yourself having to come back. 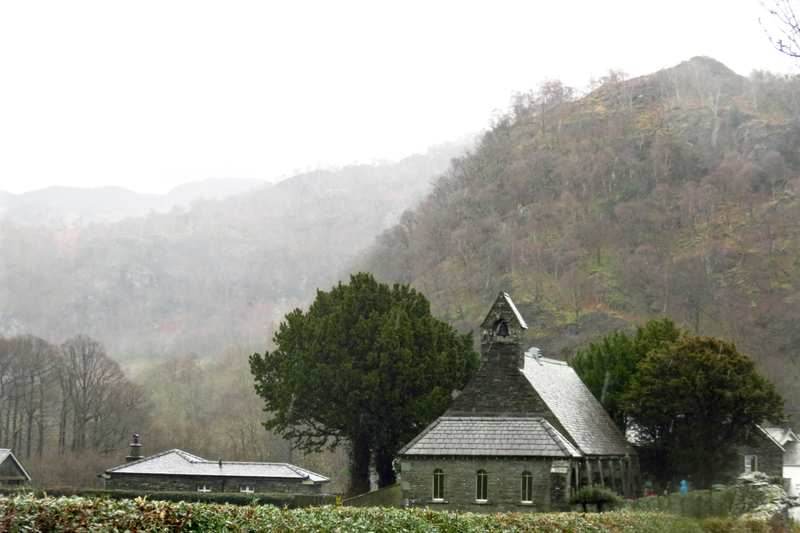 Grange church, and Grange Fell behind. To get to Castle Crag, turn right down the lane by the cafe, then left down the path past the campsite. At the bend in the Derwent (where, nearly eight years ago now, the photo was taken of a very small Joe and I that still graces the top of the walk list page), bear to the right, and begin the only real ascent of the day, up through the defile that separates Castle Crag from its parent fell, High Spy. You don’t need to go to the very top of this path. Swing left before reaching that point, through a gap in the wall, then steeply up until reaching the spoil heap. You can bypass the first section on the right, but not the second. It is a safe climb — plenty of people climb up here and none of them have, as yet, been buried in waste slate — but does need care and attention, and I remember that Joe, when aged 6, did not find it easy. 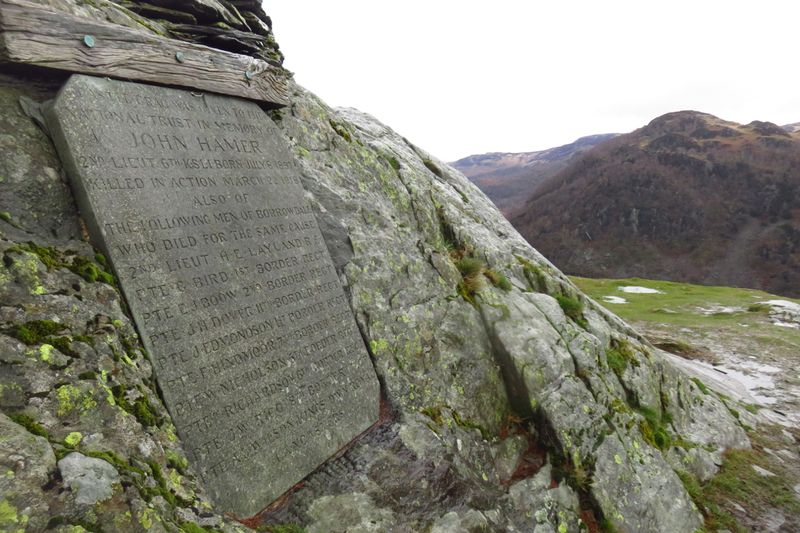 It’s only a few minutes though, and then you will be up on Castle Crag’s fine summit, with its excellent view, war memorial tablet and quarry (take care near here, too). In descent, take the spoil heap carefully. If descending to Rosthwaite, as I did, at the bottom of that upper section there is then no need to tackle the lower part. Look for the ladder stile that almost hides in a corner of a wall, under a tree and just above a steep drop. Take this, then the path heading left, and this will descend straightforwardly down to a broad lane by the river. Turn right, then not long after, take the bridge on the left, over the Derwent and into Rosthwaite. Once you hit the main road, the bus stop is just to your left, the Scafell Hotel a minute away on your right. 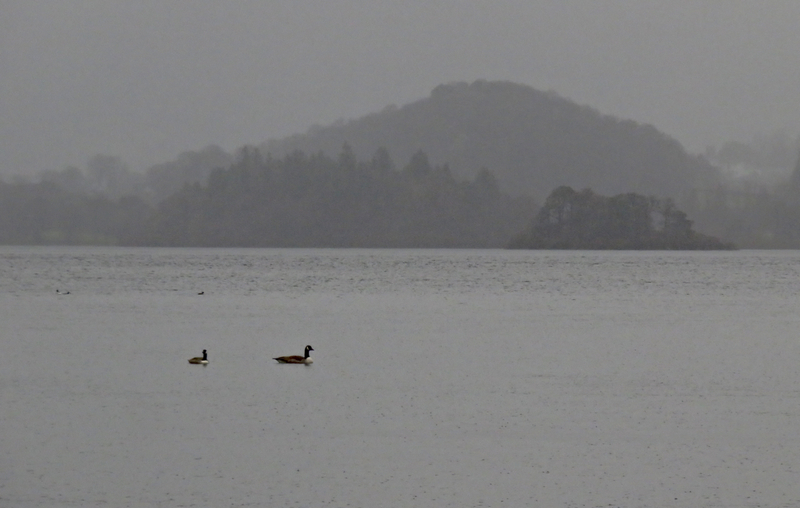 Geese on Derwentwater. Castle Head in the background. 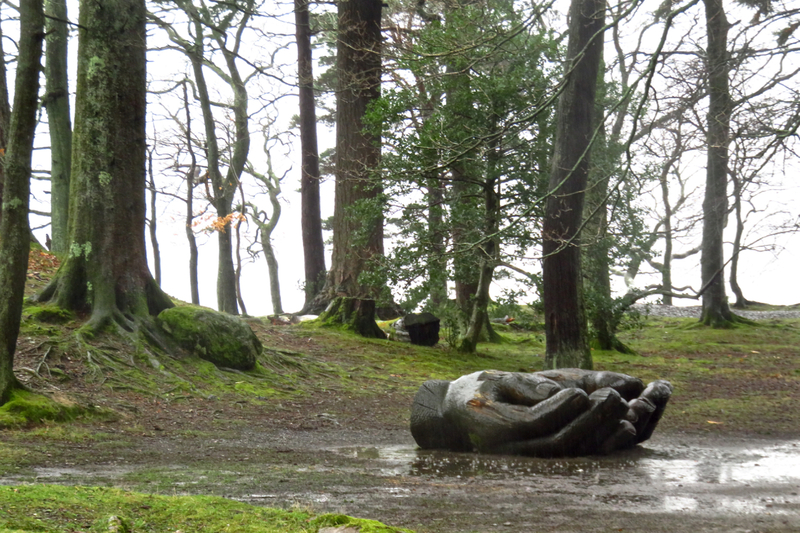 Wet walk commentary: March is a very variable month in lots of ways. The time I have available varies greatly year by year. This year has seen me with two work trips to fit in, I was away in Norway for a week (now there’s a place to get some great walking in — but not this time, I was in the Arctic, too snowy and I don’t ski), and on Monday I’m off to Japan. Nice work to get, but it hasn’t left a lot of time free, and when I’ve had time, the weather has been poor. So there’s been no Lakes walking since coming off Great Mell Fell on February 6th (walk 124), and I was very keen to get one in today. But the other variable thing about March is the weather. Despite very pleasant conditions earlier in the week, yesterday (Friday 17th) was a dismal day all round, and the forecast was only a smidgeon more tolerable for today, But I decided to go for it. I have access to waterproofs after all, so was wrapped in them from the start. With regard to the walking I just decided to keep it flexible and see what conditions were like once I came in from Penrith. On the bus it was obvious that everything above about 1,500 feet was in cloud, and the rain, though not heavily, was coming down persistently. There was a need for something low-altitude and straightforward, therefore, hence this walk. 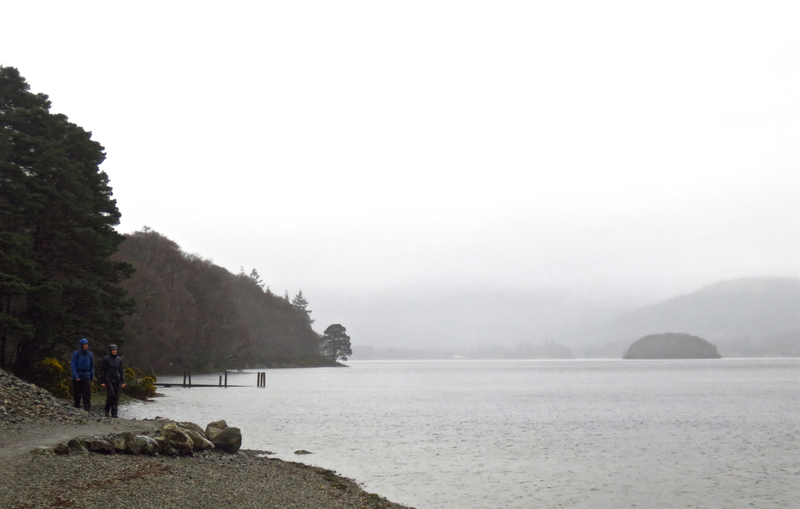 I set off as soon as I got to Keswick bus station, rather than waiting for the Borrowdale bus, reasoning that as I’d never walked down the shore of Derwentwater before, this would at least give me some fresh photo-opportunities. So it proved, but the price for this easy, accessible scenery was that there were huge numbers of other people accessing it with me — I’m not offering a complaint, after all, I was one of them, but I was just surprised how many other people were around today, considering the weather. Another view south from Castle Crag. 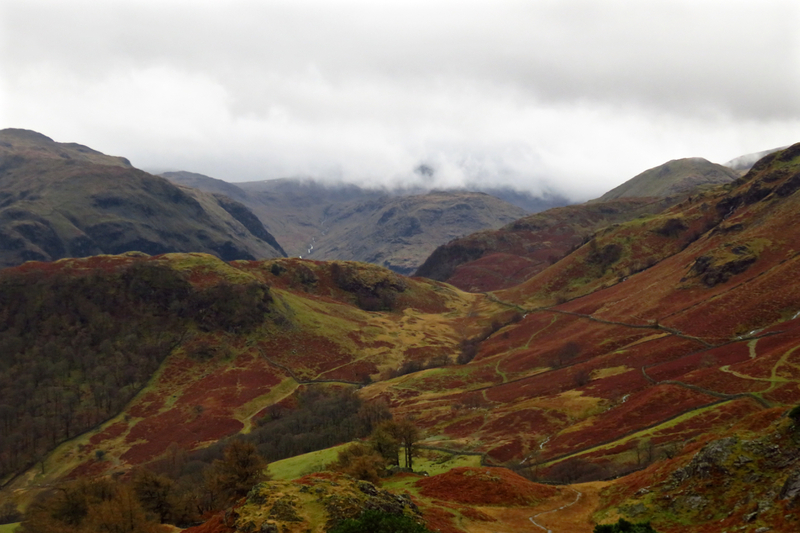 That’ll be Great Gable over there in the cloud — as it so often is. The bus back from Rosthwaite to Keswick was standing room only, literally, and the #555 to Windermere station (I went back that way because the connections were better than at Penrith) was for a time packed out with a group of about 30 lads from Kendal who were out for the day on the piss, departing en masse to terrify the drinkers in the King’s Head, Thirlspot. I guess this shows that there is the demand in the District for public transport at least at weekends, so arguments to increase capacity. But thanks to the moronocracy there will be less of it again this coming summer with some useful routes (like the Caldbeck service) reduced to Saturdays only. I do honestly wonder whether I will get all these done before further reductions and changes to the services make it simply impossible for me. 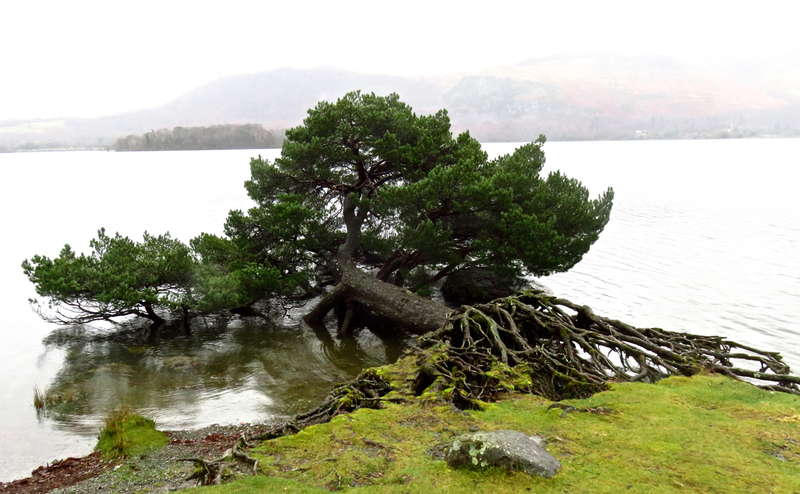 This bizarre tree is worth looking out for — growing horizontally out into the lake. Well, if that’s the case I suppose I’d better pick up the pace. Let’s get Japan out of the way then hope for some better weather through April and May, when I do have more time. Next walk within three weeks I hope. I need to get out to the Western Fells particularly — I have only done four from that book out of the 91 second bags so far.